In 1977 United became one of the first British clubs to agree a deal with German kit manufacturers Adidas. The new artificial polyester Away kit was a white version of the Home kit, with a black V neck collar with lapels, and the now recognisable trademark three stripes running from the collar down to cuffs on both sleeves. The diagonal DUFC motif that had been on the shirt since 1973 was now replaced with a more modern looking "DUFC" that ran horizontally on the left breast, and on the right was the Adidas logo. The black shorts had three white Adidas stripes down each side, and the Adidas logo on the bottom left. The white socks were topped with three black stripes on the turnover. 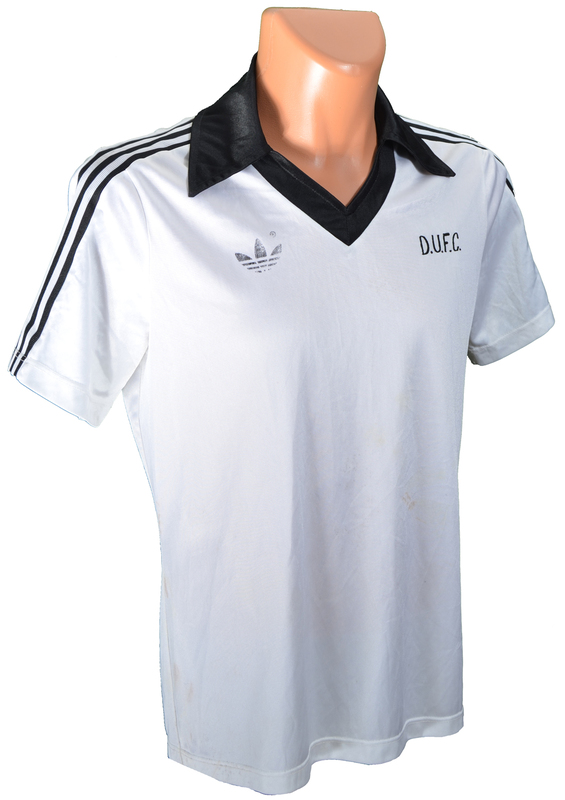 This version of the Adidas kit lasted only one season, before the 1978/79 kit returned to the diagonal "DUFC" badge, and the slightly changing size of the collar lapels to suit the fashions of the time.